Two regional states, Iraq and Pakistan are struggling with religious extremism and sectarianism, political deadlock, corruption and economic decline. This approach may hold lessons too for the second state, Pakistan. ISIS in Iraq threatens to execute a fourth British hostage amidst much fear, even as Washington, Tehran and Baghdad send in reinforcements. Anarchy reigns across northern and western Iraq. While the United States came to Iraq with grand ambitions for a pro-market, democratic state, what its policies really did was cripple most of its institutions. A dysfunctional army and the biased premiership of Nouri Al Maliki created a perfect scene for the reign of anarchy, as the chosen prime minister set about to subdue Iraq’s Sunni population. 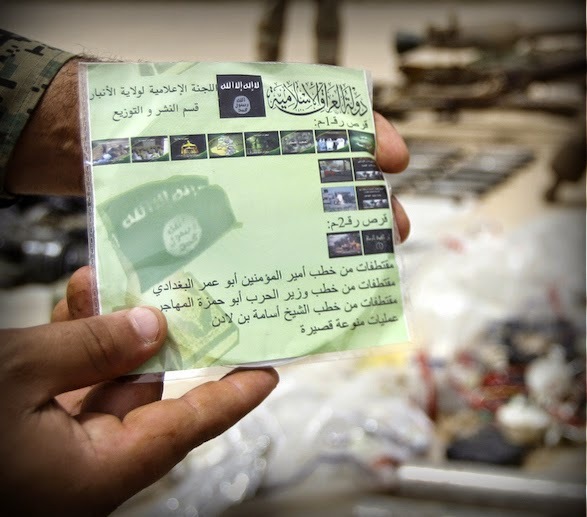 The resulting ISIS is a nihilistic cult that might have come from a Harry Potter movie. Rudimentary social services, such as free grocery and petrol distribution, have managed to win over part of the population in the areas they control. Though short term, for now, it gives them a support base, and adds fuel to the fire of growing extremism. To analyse this uprising against a dysfunctional government, it seems as though the government and its officials may have actually enjoyed their journey to reaching an ISIS-ridden state. Even though Nouri Al Maliki barred all top officials from holding dual citizenship (in accordance with the constitution), including Iranian Iraqi VP Khudayr al-Khuzaie and British Iraqi Foreign Minister Hoshyar Zebari, most of them seem to be well seated in their respective offices. Bribery is said to be the dominant currency in Baghdad. Top officials have bled the country dry and now live in exile, happy to invest the black money in Iraq’s property market. Everything is for sale. Obvious scams continue to receive blanket coverage from the government, as officials keep each other covered for fear of losing out on their own income. The National Reconciliation Project in Iraq was said to be “not alive” by former MP Wahida al-Jumaili. Stating financial corruption as a reason, the MP went on record to say that the money was politicized and used as bribe payments during the past ten years. 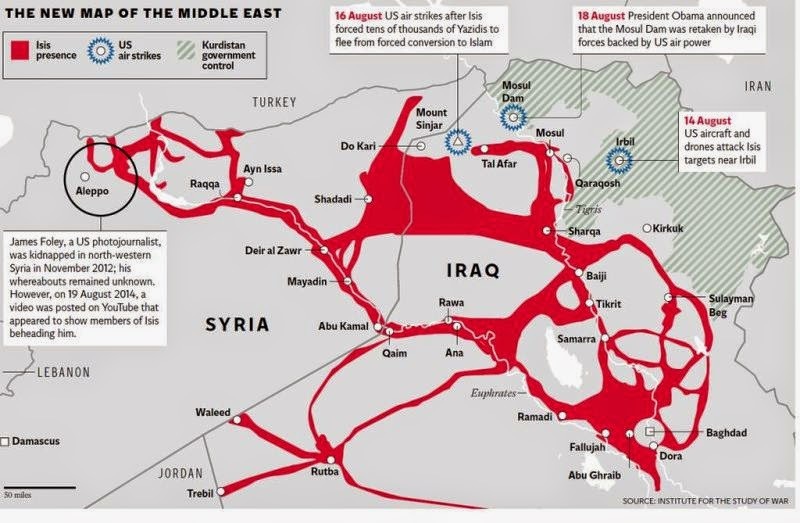 ISIS’s entry also aligned with the expulsion of Sunni members from the army and government posts. Indeed if anything, protests by the community of largely Sunni Fallujah in May 2013 should have been an indicator for Maliki to blur the sectarian lines in his government. Once favoured by Saddam, the Fallujah, Ramadi and Haditha Sunnis led a fierce protest against the Shi’i centric government, depicting their resentment at blatant exclusion from the administration. Mis-governance and corruption together have had a detrimental effect on Sunni and Shiite populations alike. Shaami daish tanzeem ke sarbarah Abu Bakar Baghdadi kharaaj taheesh pesh karte hai. - Awaami Baagi Group, Bannu Waziristan. /We pay tribute to the leader of ISIS Abu Bakar Baghdadi. - Public Rebel Group, Bannu Waziristan. As Iraq and the US scramble quickly to clean up the mess, another state seems to be following a similar model. 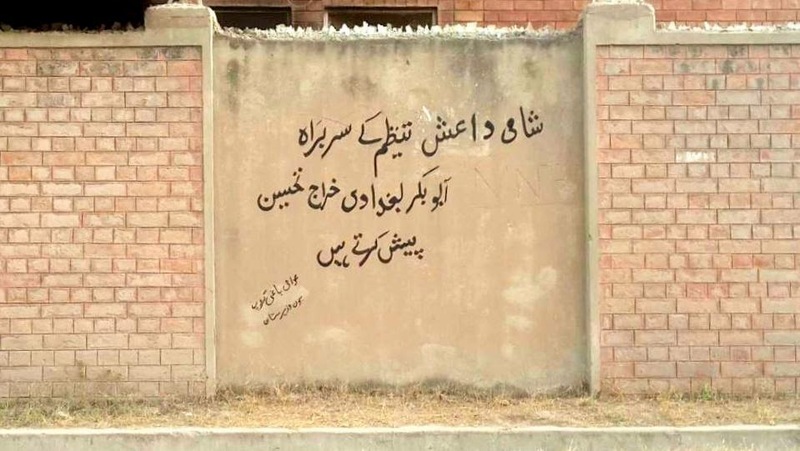 Recently, ISIS literature was reported to be circulating in Khyber Pakhtunkhwa, a conservative province in the north-western part of Pakistan, while in south-western Baluchistan ISIS graffiti appears on walls in plain view. Even though their presence has been denied, de-facto jihadist forums and social media forums carry evidence of otherwise. 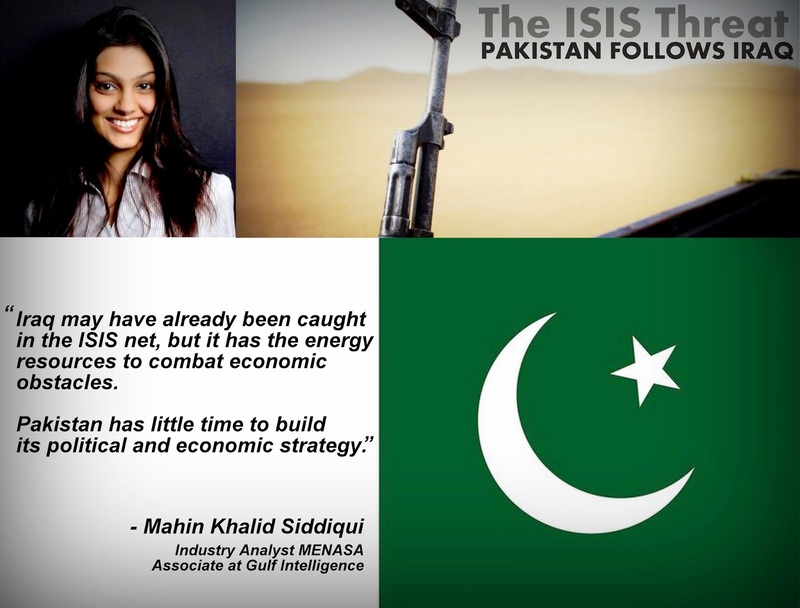 With ISIS thriving on economic disparity, it seems like Pakistan is a logical next step for them to be pursuing. Interestingly, a military operation against militants, titled Zarb-e Azb (a sharp cutting strike), is already underway focused mainly in Pakistan’s Federally Administered Tribal Area (FATA) to wipe out militants, and yet ISIS marketing seems to have effectively reached the area. This supports Mr Altaie’s statement on the futility of a purely armed strategy against ISIS and raises the more dangerous question of whether Pakistan is the next Iraq? Certainly the political, economic and social situation seems to be in their favour. With nationwide protests against a corrupt government, and a continuous rise in poverty, it seems like the US’s hopes for Pakistan seems to have failed as well. A sham democratic government, which came into power by unashamed rigging, was unable to control floods when just-built infrastructure in the capital city Islamabad gave away during the monsoon season. The government seems to be following the Iraqi model on not delivering to the public, while building personal coffers. Prime Minister Nawaz Sharif and his son, a New Zealand national, seem to be in talks with Indian giant Mithul Steels for a possible business partnership that is rumoured to supply metro rails in Nawaz’s own city of Lahore. His political strategy seems to be focused on appeasing his business interests, rather than on popular opinion. Recently, the Premier was criticized by public and politicians alike for his silence on the Indian Pakistani Wagah border skirmishes and the consequent deaths of his countrymen. With Nawaz’s focus on building family business alongside his political career (his brother is the Chief Minister of Punjab), and former politicians living abroad but with vested interests in the country, regular public protests point towards a growing unrest in the country, creating perfect ISIS circumstances. In both countries, the public sees national resources depleted in front of them. Farmers in Iraq see oil rigs functioning day and night, but no money is put to use for their benefit. 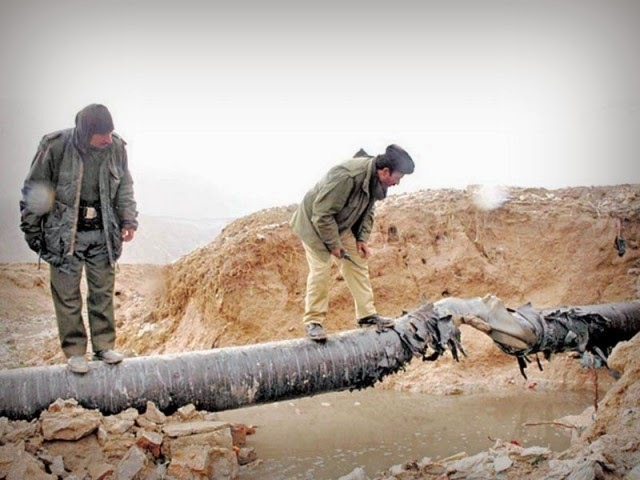 In Pakistan, protesters from gas rich Baluchistan witnessing the daily distribution of CNG to the many vehicles, public and private, led an attack on the the 24-inch gas pipeline in Dera Bugti, resulting in immediate halt in supply to the purification plant in Pir Koh. They demand a fair share in gas revenues to improve quality of life for the province. Baloch separatists demand an equal share in revenues from minerals and more importantly, gas generation. The state has serious reservations over the gas distribution revenue (GDS) system. Under the old GDS formula, that takes into account the wellhead price, costs of utilities including operating charges, gas losses and return on assets and end sale price of gas excluding sales taxes, the province is worse off. Initial investment in gas in Baluchistan was made in 1952, when well head costs were much lower and easier to invest in, argues the province. In 1990, when the revenue-sharing formula was introduced, the province produced 70% of the total gas in Pakistan, and was receiving its appropriate share under the agreed terms. Today it produces 25% of Pakistan’s gas and is dissatisfied with the GDS formula, demanding to take into account the actual gas contribution by Sindh and Punjab that were invested in pricier times. Baluchistan’s Sui field is still the country’s single largest gas field, which produces around 800 MMscf daily from 87 wells but during the past five years, Baluchistan is receiving merely US$1.19 per MMBtu while Sindh enjoys $1.23 per MMBtu and Punjab $1.76 per MMBtu for some of its wells. Pre-2013, the average well head gas price in Sui field was $0.98, and in 2013, $1.36. Therefore if GDS reforms were to be introduced, the province would receive exactly the same share as Sindh. As the federal government subsidises the sale of natural gas without any consent from the Balochi public, ethnic violence is also on the rise in the area. This energy resource-based separatism can be compared to that in Iraq’s Kurdistan region. Pakistan may not have Iraq’s energy wealth, but it is a significant gas producer, with a vast booming agricultural sector. Nevertheless, it is indebted to the IMF with the currency at its weakest since independence, at 102 PKR equivalent to 1 USD. Regular power cuts and water shortages are the norm in both countries. In some areas of Pakistan, power outages last for 18 hours. Citizens in both states ask for basic living amenities. Even Baloch separatists can be appeased with equal and fair revenue sharing, which point to the fact that they are reconcilable. A historical overview of Iraq and Pakistan shows the general public is not extremist in its religious mind-set, which also shows a positive outlook if dialogue for moderation is employed. 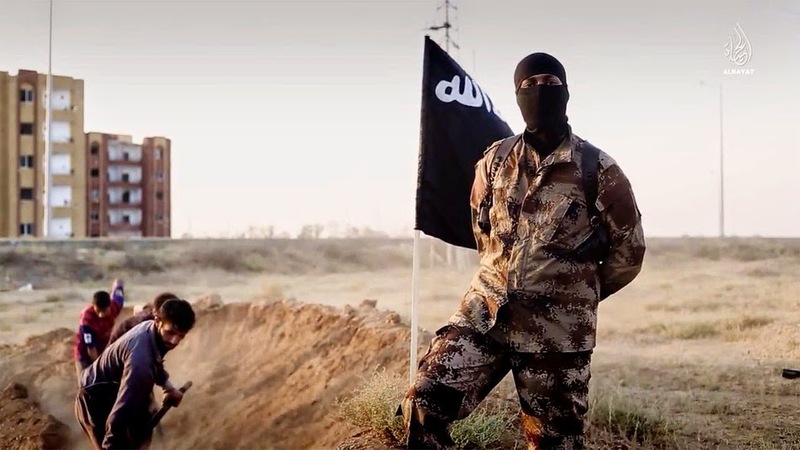 However, the entrance of ISIS in the country is alarming, specifically in the energy rich Baloch province, already boasting of separatist movements In one case the government has failed; in the other, it is quickly moving towards failure. Iraq may have already been caught in the ISIS net, but it has the energy resources to combat economic obstacles. Pakistan has little time to build its political and economic strategy. Right now, with ISIS at its borders and ready to look for recruitment from its vast human resource, it’s time Pakistan learns something from Iraq, and finds its equivalent to energy to fight the looming threat.